Absenteeism is not something that is confined to a few sectors of the economy. It is one of the most persistent obstacles to productivity, profitability and competitiveness. 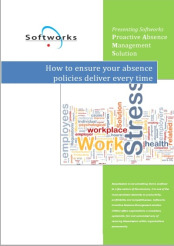 Softworks Proactive Absence Management solution (PAMs) offers organisations a consistent, systematic, fair and automated way of reducing Absenteeism within organisations permanently.